Savory Stuffing made in your crockpot to save space in the oven! Make ahead this moist on the inside Apple Cranberry Stuffing with hints a sweet cranberry and tart apples with crunchy edges on the outside! I’m not sure why we tend to only eat stuffing at Thanksgiving. It’s a comfort food classic that works with so many things and when the seasons change I love to make things that are toasty and warm. We have both dressing and stuffing at the holidays and there are several questions that come up when I make it. Today Im going to share a time-saving method for making dressing and answer some of the most common questions when you make stuffing. What is the difference between dressing and stuffing? What is the best bread to use for stuffing? How do I make a Thanksgiving side dish without using the oven? The components are the same but traditional stuffing is cooked inside of the turkey and dressing cooked in a dish. A lot of people use the words interchangeably . At our house we make both versions and we like the different qualities of each of them. Stuffing is usually much more moist and wetter than dressing. Dressing is moist on the inside but tends to be a little crunchy on the edges where it is exposed to the heat more. Both are delicious and compliment any protein you serve it with! 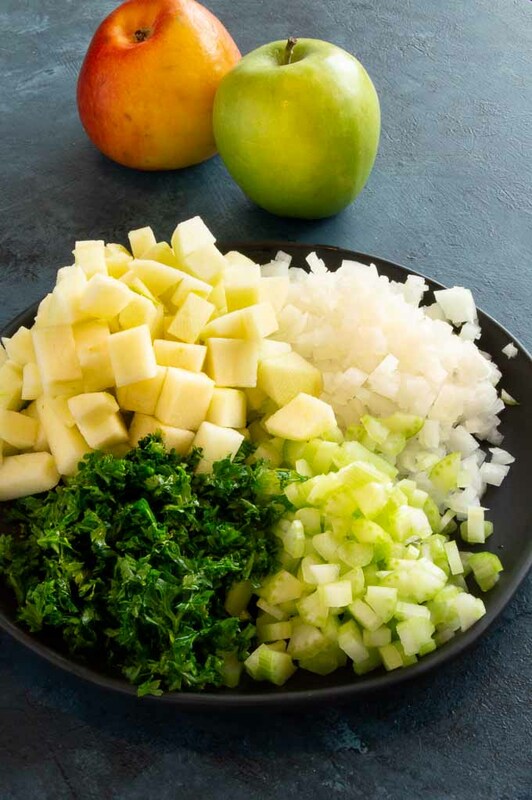 What goes into a successful, flavorful make ahead dressing side dish? It’s super easy to make your own bread cubes for homemade stuffing. I used regular white soft bread for the photos you see here but you can use any bread you have. I like a mix of soft bread and a crusty French loaf. Cut the bread into small cubes and place on a baking sheet in your oven over night to dry it out. (The oven is off, its just a way to keep the cubes off of the counter.) It’s way better than the boxed stuff at the market and you can control the seasonings in your recipe. By all means if you are short on time a boxed package of dressing mix will work but if you have the time make your own. Your guests will love you! 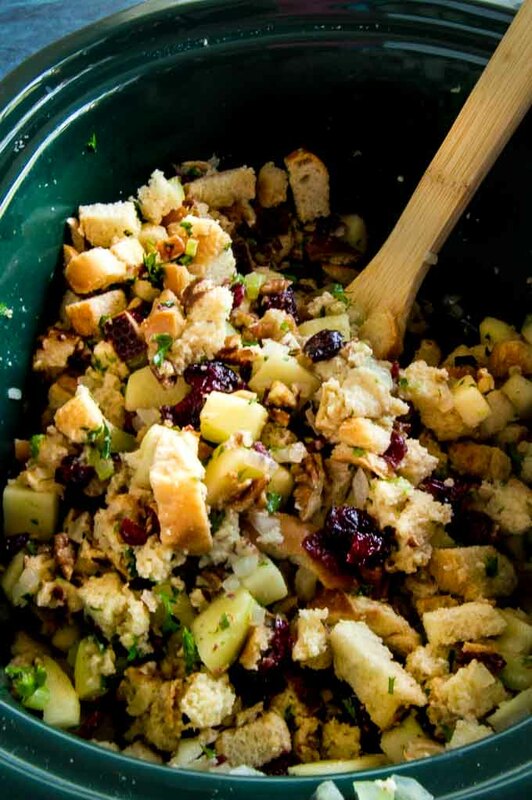 How do you make Crock Pot Stuffing? 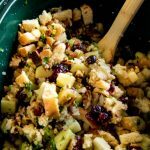 Making your stuffing in a crock pot saves valuable oven space for big holidays like Thanksgiving! Make your own bread cubes, dry them and place them into the crock pot..
Chop the ingredients into small bite sized pieces. Sauce the onions and celery so they soften a little before you put them into the crock post. 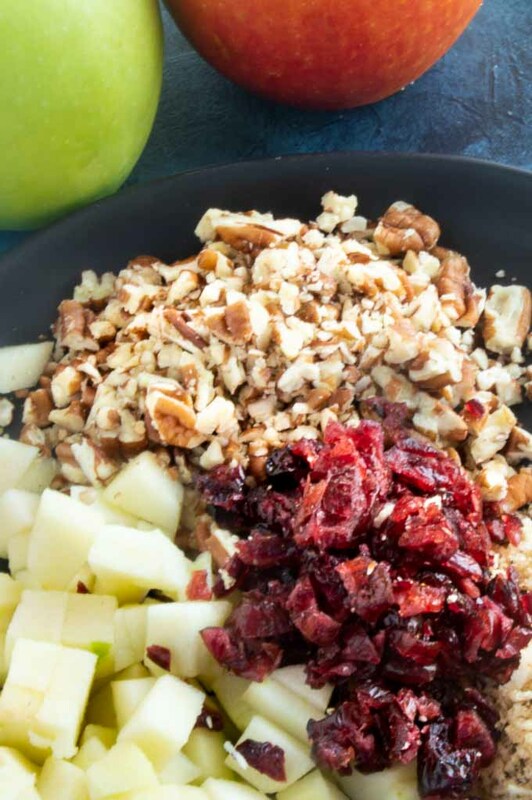 Add the texture ingredients of cranberries, apples and pecans direct to the crockpot. Season with spices of parsley and poultry seasoning. Add melted butter and chicken stock to just barely moisten the bread. Cook on high for 3-4 hours stirring a couple of times. 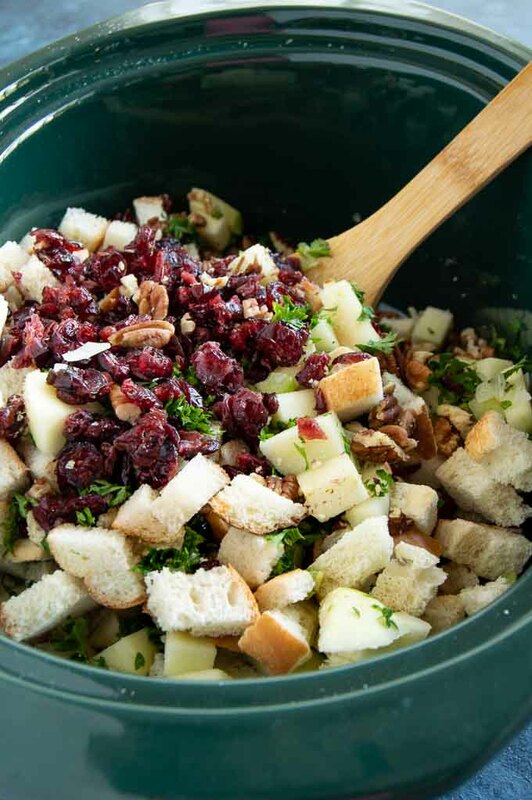 Add bread cubes, celery, cranberries, apples, nuts, parsley, poultry seasoning, and sautéed onions and celery to the bottom of the crock pot. Stir to combine. Add melted butter evenly over the top of the bread mixture. Add the broth 1/2 cup at a time to just barely moisten the bread cubes. The amount you will use depends on how dry your bread is. Do not over wet it, the onions and celery will release more water and you want to have a moist stuffing, but you want a lot of the bread to hold its shape. Turn crock pot to high, cover and cook for 4-5 hours until edges are slightly crispy and center is moist. Stir several times while cooking. Season to taste with salt and pepper and serve. I am definitely saving this for the holidays. I love that it doesn’t have to go in the oven and that looks like such a delicious combination! Great idea to use the crockpot. We all need extra oven space during the holidays. I like the idea of making stuffing in the slow cooker. It will definitely save oven room. It looks so delicious. Love the crunch from the nuts too!